LOADED. FRUIT. NACHOS. Delicious, crispy apple slices loaded with fresh fruits and topped with an array of delicious goods and drizzly toppings? Yes guys, I mean ALL OF THAT! All of that is happening right now, and it’s the definition of healthy meets greatness. Seriously, I don’t even know where to begin. Except to let you know that what you’re looking at is actually what dreams are made of…except this is totally reality and can actually be made in your kitchen in under 10 minutes. SCORE. Did I mention that they’re freaking delicious? SCORE. What about the fact that they’re called nachos but they’re actually healthy? SCORE SCORE SCORE. Now, this is the type of appetizer that you want to whip up when you’re really trying to bring your A game. This is what you make when you’re hosting game day and want to make it look like you just spent 30 minutes whipping up total perfection, when in reality 20 of those minutes were spent dancing on the kitchen counter to Selena Gomez. Just me? Ooh…awk. Whatever the occasion, this is a sure fire way to please your hungry little goblins..I mean guests 🙂 You know what, there doesn’t even have to be an occasion. Like, I totally sat in bed, yoga pants in full effect, with a plate full of fruit nachos watching Jane the Virgin. LIFE! 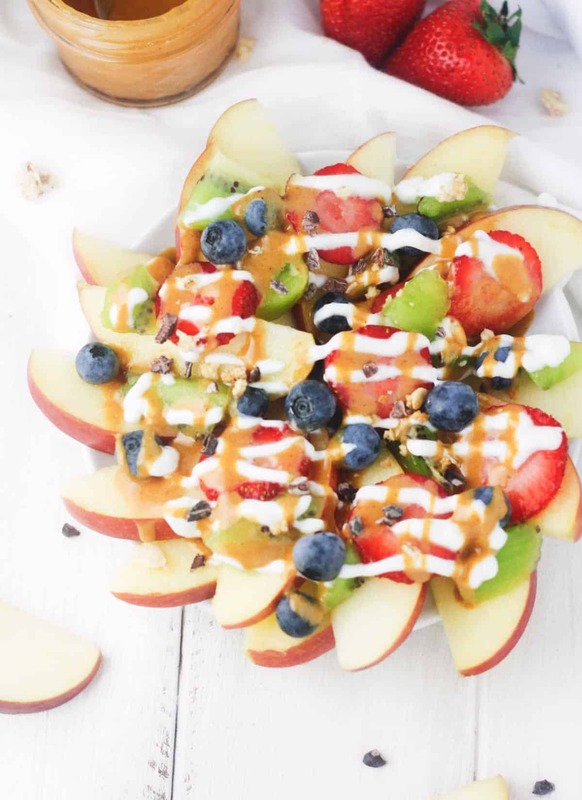 The best part about these fruit nachos, or any nachos in general really, is that there aren’t any specific ingredients that you have to follow. Don’t have blueberries? No biggie. No strawberries? Ah, raspberries are just as perf. The only one fruit that I would recommend sticking to however, is the apple. It pretty much lays down the foundation for these nachos, creating the perfect fruit “chip” to pick up all of those delicious toppings. As for those mouthwatering drizzles, they also aren’t absolutely required, buuuuut I highly recommend at least keeping the PB Maple Drizzle. Actually, JK I’m making it a requirement to keep the PB drizzle because your taste buds need it. That, I just know. Thinly slice the apple and arrange onto a plate. Top apple slices with the remaining fruits, cacao nibs and granola. Drizzle with Greek yogurt and PB Maple drizzle. Enjoy! This recipe is for 2 servings. If you are feeding a larger crowd, simply adjust ingredient quantities to suit your needs. For a vegan friendly option, simply omit the Greek yogurt! What a fun snack for kids! Healthy, creative and the name would definitely make them want to devour it! Fruit nachos are so much fun! My kids go wild for them every time! Haha I can totally relate with your kiddos! I just love the PB maple drizzle on top of this baby!!! Makes it so gorgeous and festive. And I too would spend 20 minutes dancing if I managed to produce this. The PB maple drizzle is soooo good! On E V E R Y T H I N G!